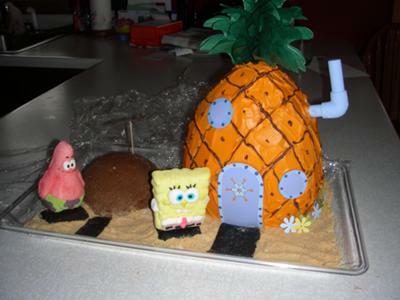 This SpongeBob theme cake was made with a football shaped baking pan for the "pineapple" house and a round pan for Patrick's "rock" house. With graham cracker crumbs as the sea floor and the football placed on end we were able to decorate as bikini bottom. Also, we used pineapple flavored cake which added to the fun. Enjoy! My 5 yr old would totally love his as would my 2 yr old neice!!! OMG! THANKS FOR THE GREAT IDEA!!!!!!!!!!! !